Tom was first diagnosed with brain cancer in 2003 and had surgery to remove the tumour in December that year. Due to its position, the tumour was never fully removed and was monitored for growth or changes since the surgery in 2003. Tom had a second surgery in early 2008, after a scan showed that part of the tumour had grown. 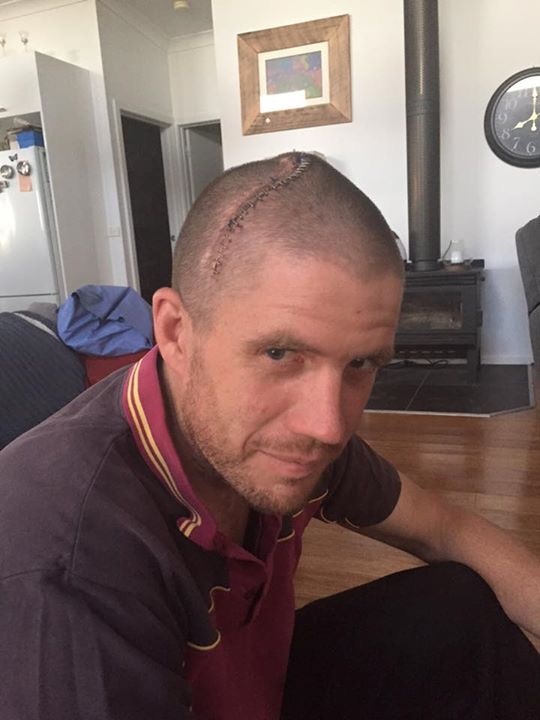 He had a biopsy in 2014 that confirmed the tumour had returned and now sits in the motor cortex. While the tumour was not in a position to be treated by surgery, Tom has been on oral chemotherapy, and up until a few weeks ago, was able to work and carry on with living his life as normal. Tom has managed to sustain his employment to support his family. However, he has no sick leave entitlements remaining due to medical appointments and the affects of taking the oral chemotherapy. Unfortunately, Tom recently began to experience new symptoms that caused him concern and decided to get checked out by his neurologist. He was informed that a new malignant tumour has developed which needs to be removed immediately. It is unclear if Tom will lose his eye sight, movement down the left side of his body or have speech impairment after the surgery. Tom requires a minimum of six weeks recovery period and does not have enough sick leave entitlements for this period of time. Tom and his family also have to come up with the cost of the operation before surgery takes place. Tom is the most humble of young men. Tom has never complained about his condition and he is always smiling and says ‘it is what it is.’ Tom is a Youth Educator who works tirelessly and effortlessly in supporting at risk and vulnerable young people to gain an education. I am hoping to raise enough money for Tom so that he can spend the six weeks recovery period focussing on healing without the added pressure of financial stresses while not being able to work. Tom provides for his wife and two children aged six years and three years. Please help me raise this money for our friend and work collegue so that Tom and his family can enjoy this festive season without financial stress and worry. 'Given that you have all shared so generously with me over the last few weeks I thought it only fair that I share some of the nitty gritty with you. Now that we are at home I have had some time to digest a little and work out what I wanted to share and what I didn't. 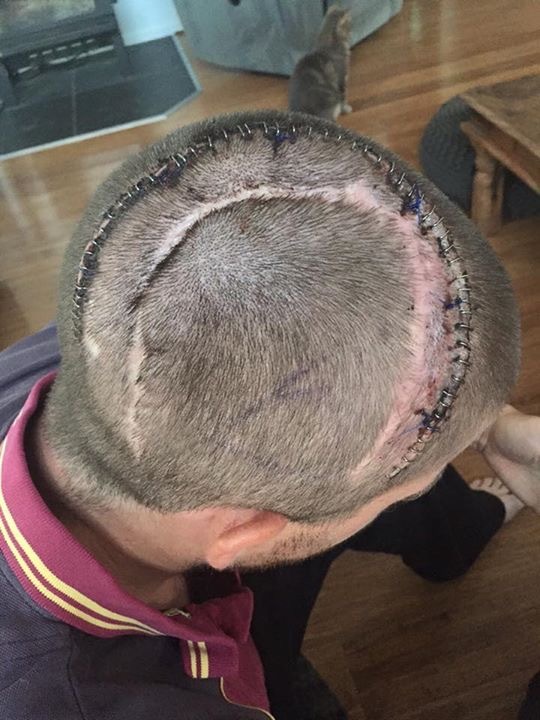 I decided I would share a few of the external shots as its not often you get to see someone with 60 staples in their head! For whatever reason. This was a new incision as the other one below it had already been opened 5 times. I can't show you what happened on the inside yet cos I haven't seen myself but I can try to tell you. I had some amazing doctors using amazing techniques before and during surgery to determine what they could safely remove surgically, and what would have to wait for radiotherapy. Thankfully the area that was causing issues wasn't in my motor cortex, it was just putting immense pressure on it, hence the symptoms. Actually I had a seizure the morning of surgery that had me unable to talk during it and left my left arm dead for about 5 mins after, I thought this was how I'd be after surgery. Anyway they removed what turned out to be a rather nasty piece of tumor without causing any issues and then proceeded with the not so nasty stuff and cos I was awake we were able to work together to determine what should and shouldn't be removed! Post surgery I was so happy to realize that my eyesight hadn't diminished, that I could talk and that my left hand was functional (mostly). We got the pathology results back on Thursday and weren't surprised to learn that the nasty part had progressed from a grade 2 to a grade 4 (there are only 4 grades), so as scary as that is it just means that we need to take care of each other and hold hands as we tackle this thing HEAD on! The next step is 6 weeks of radiotherapy in Melbourne starting early January. I am in awe of this man's strength and courage. Lets see if we can get Tom's Brain Tumour Support to $15000 so we can triple our goal! Please keep sharing and spreading this story about this remarkable man. jsut a few battle scars! A huge thankyou to all that shown support and love to Tom and his family. 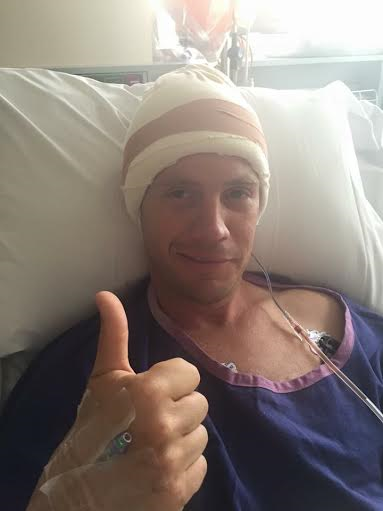 Tom is out of surgery and wants to let his supporters know that he is ok with a big 'thumbs up!' The surgeons were able to remove the most concerning bit of the tumour but they couldn't remove some of the tumour that is controlling all face and hand functions. This will be tackled with radiotherapy. 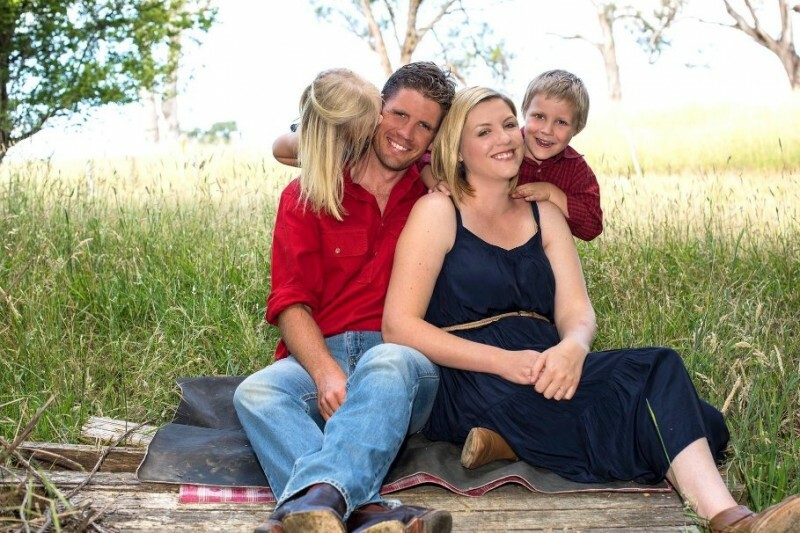 Tom and his wife are overwhelmed and extremely grateful with all your love and support. A thumbs up from Tom! I'll be keeping you and your family in my thoughts this holiday season. With love from the team at Ku Lance. James probably doesn't want me to say anything, but he asked me to donate the money we collected for his birthday present. With love from the 'Love For A Brother's Brother Charity Thing'. Thoughts with you and your family Tom.